CruiseControl.NET has an extensible plug-in architecture. While documentation on how to take advantage of it is sparse, there are some sources I’ve found helpful: Custom Builder Plug-in, which is a tutorial on how to write a plug-in derived from ITask, and the TFS Plug-in for CruiseControl.NET project on CodePlex, which is a great code resource for writing a plug-in derived from ISourceControl. 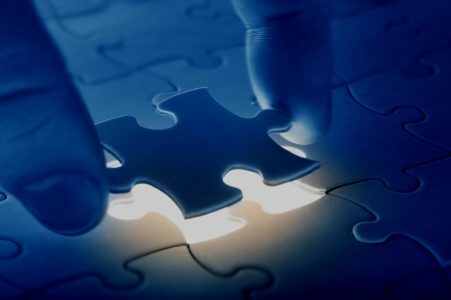 In this post I’ll discuss two custom plug-ins, both derived from ISourceControl, whose shared purpose is to retrieve source code prior to a build. The only difference is that one interfaces with Subversion while the other, Team Foundation Server. While there are obviously coding differences because of this, the general workflow of each plug-in is the same. There are minimally two dll’s you will need to add as references to any CC.NET plug-in project: ThoughtWorks.CruiseControl.Core.dll and NetReflector.dll. The Core dll contains the interfaces and other goodness; NetReflector contains the attributes you’ll need to mark your classes, methods, etc. so CC.NET knows what to do with it. Once you’ve installed CruiseControl.NET, you’ll find both of these assembles in the C:Program FilesCruiseControl.NETserver folder. Writing an ISourceControl plug-in is very similar to creating an ITask plug-in. Rather than duplicate work by writing up on my own tutorial, I’ll instead refer you to the Custom Builder Plug-in, which takes you step-by-step on how to write an ITask plug-in. Also, refer to the TFS Plug-in for CruiseControl.NET project as that contains a lot of good information. If source has not changed, CC.NET pauses and checks again later. If source has changed, it will do a ‘get’ and proceed with a new build. The ‘get’ part is where our ISourceControl-derived plug-in comes in. Before I jump into the plug-ins, a quick word about how I solved the “update version never-ending loop” problem: as described in Part 5 of this series, my Update Version task updates each assembly’s AssemblyFileVersion attribute in each of the AssemblyInfo.cs files before checking that file into source control. The next time CC.NET runs, it sees that change, picks it up, and does another build. 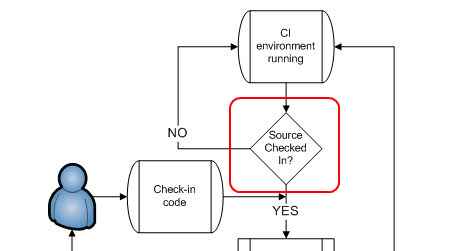 This creates a looping situation since, once again, the version is updated and checked in so that the next time CC.NET checks for new source… I’m sure you can see where this is going. The way I solve this is to have the Update Version task add a special marker into the source file’s comment on check-in. When the Get Source plug-in sees that marker, it ignores the file. If that’s the only change, it goes back to sleep. No looping. Problem solved. Deriving from ISourceControl requires us to implement a handful of methods. We’ll get to those in a minute. For now, note the ReflectorType attribute, which names the task for use by CC.NET. 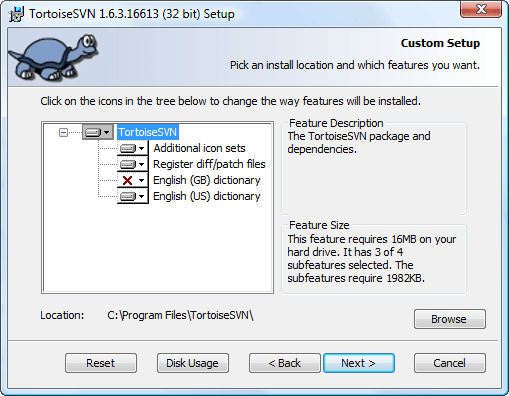 2: /// Subversion username, can be set in TortoiseSVN settings if installed. 8: /// Subversion password, can be set in TortoiseSVN settings if installed. 14: /// The local working folder where Subversion commands will be run. 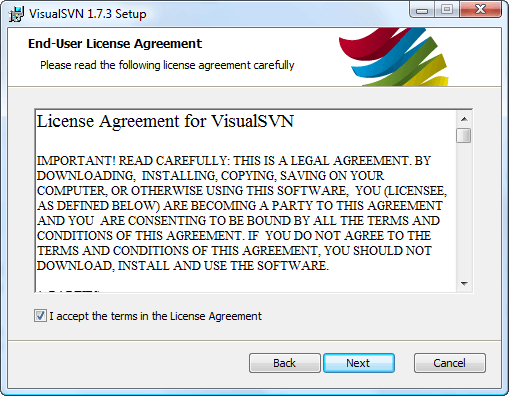 20: /// The SVN executable, including path if necessary. Similar to how the ReflectorType attribute defines the CC.NET task, ReflectorProperty defines properties for the task. Note that if you are using Visual SVN/TortoiseSVN, you can set your credentials through those applications and do not have to add them as properties in your ccnet.config file. 2: /// Retrieves a list of modified files from Subversion. All of the works happens in GetModifiedFiles, which is jam-packed with action. It’s a big method, too. I’ll go over it in pieces. There’s a lot of massaging of the stdout output; I left that out of the above snippet so we can get to the good stuff, which is to build up a Modification object and add it to our modifiedFilesList collection. Since the collection was passed in using the ‘ref’ keyword, the list we build here is passed back by reference to GetModifications whereupon it is returned to CC.NET. 2: /// Retrieves changed files from source control. 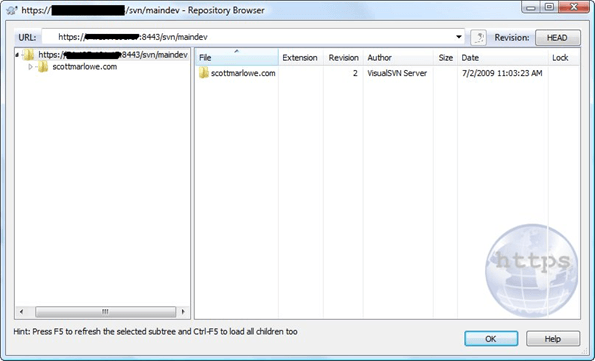 RunProcess runs an SVN update on our working directory. This has the effect of retrieving any source that has been modified since the last time we did an update. With that, we’re ready for CC.NET to perform our build. I’ll be going over CC.NET’s ccnet.config file in Part 8 of this series. 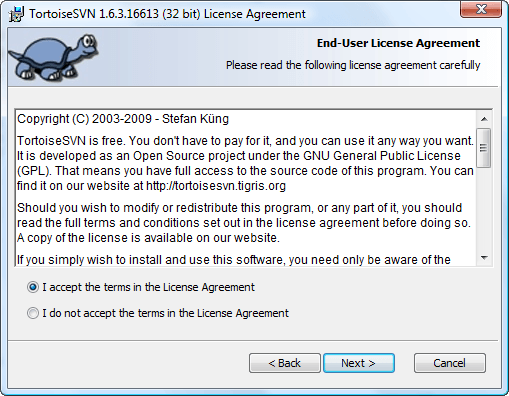 That’s it for the Get Source SVN plug-in. I won’t go into a lot of detail on the Get Source Plug-in for TFS as it is very similar to the Update Version Plug-in for TFS discussed in my last post. Besides for that, I didn’t write this plug-in. Credit Martin Woodward with that Herculean feat. I did, however, make one small change to his code to handle my special marker scenario. Which quite simply looks for the marker. If it finds it, the file is ignored inasmuch as the change set is concerned. This plug-in stuff is exhausting! But we’re done now. Hopefully between this post and the last one you have enough information to write just about any CruiseControl.NET plug-in you might ever need. Note that the download contains my modified version of Martin Woodward’s TFS Plug-in for CruiseControl.NET. I can’t guarantee I have the latest and greatest source for that, so visit the CodePlex site if you want to start with his newest code. Also, the CCNETPlugins download contains both the Get Source and Update Version plug-ins. I’m a long time user of—cough, cough—Visual SourceSafe, both at work and home. At home it’s done pretty well. At work, with dozens of users, not so much. We’re solving the problem at work by migrating to Microsoft Team Foundation Server. This has prompted me to think about my home/personal solution for source control. While I could continue to use VSS, I thought it was time to take a look at Subversion, which I’d heard a lot of good things about. Subversion is free to inexpensive, it’s open source, and there are a wide variety of implementations and tools from which to choose. Factor in VSS’s most debilitating feature, or lack thereof, that being remote access, and moving to the right Subversion package was a no-brainer. Simple as that, if only there weren’t so many implementations. Fortunately, I’d done some prior research about a year ago when the idea of moving away from VSS started nagging at me, so I already had an idea which package I wanted to use. As if you couldn’t tell from the title of this post, that implementation is Visual SVN. In this post, I’ll take you through the installation of both the server and client pieces. Note that while the server piece is free, the client costs $49. 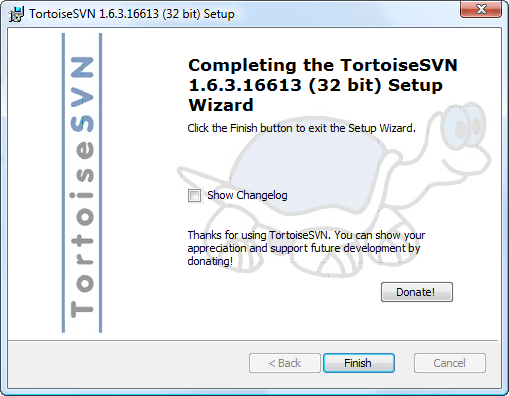 You can get by with just Tortoise SVN (which is free) on the client-side, but I wanted a solution that integrates with Visual Studio. Installing the server is pretty straightforward. I’m going to install on my home Windows 2003 server. You can probably install on your local machine, but I wouldn’t recommend it. 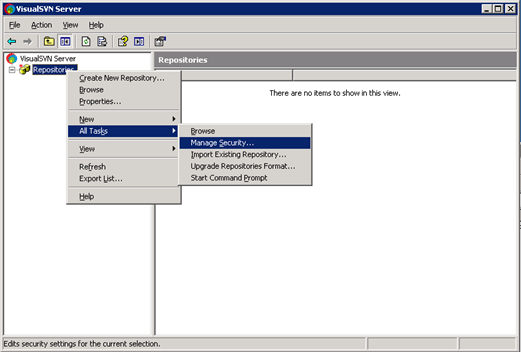 It’s better to have your source control repository on a separate box for safety if nothing else. I do have the added bonus of being able to access my home server from any location (including SVN once it’s installed), so I definitely want my repository there. I was happy with all the defaults but for the Authentication selection. I chose to select “Use Windows Authentication” because my Windows 2003 server already acts as a domain controller, so I figure why not use my existing credentials? Install Location is what it is; change if you like. Repository, again, is up to you. I left it alone. Server Port is the port Visual SVN Server will listen on for incoming connections. I chose to keep Use secure connection checked. I’m not that concerned with security (most of my personal/home projects are available via this blog, anyway), but I figure if it’s there and it works, why not? 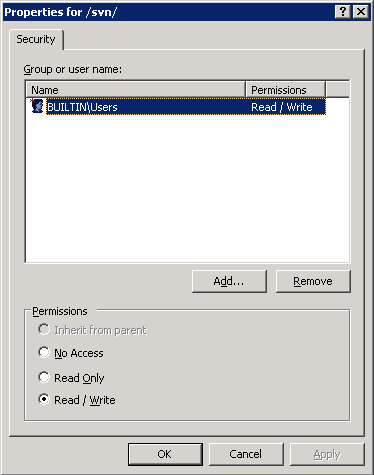 As above, I selected “Use Windows Authentication” as my Authentication scheme. When you’re happy with your selections, click ‘Next”. 5.) Almost done. Click ‘Install’. 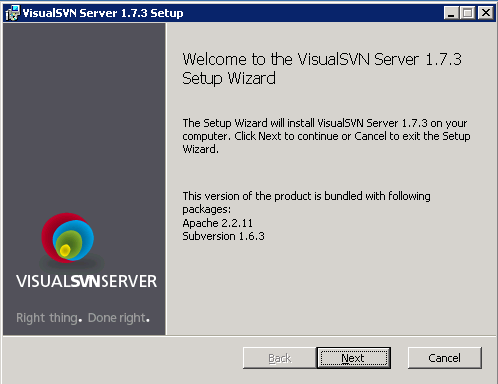 Wait while Visual SVN Server installs. 6.) 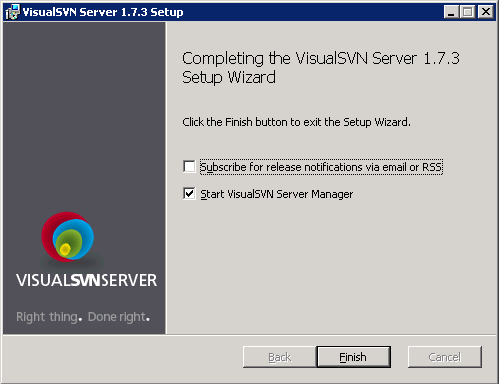 Click ‘Finish’ to launch the Visual SVN Manager. 7.) With the Manager running, you’ll see the following dialog. 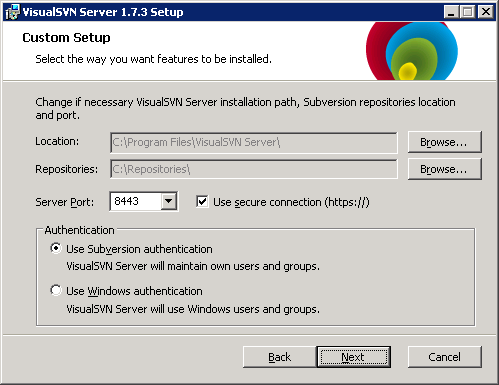 Visual SVN Server runs as a Windows service, so the Manager is really just the management interface, and doesn’t need to run in order for you to access your source control repository. There’s a generic group already there. I removed it, and added my own domain login explicitly. By default, you’ll have read/write access. That’s it for the server install. Let’s install the client. 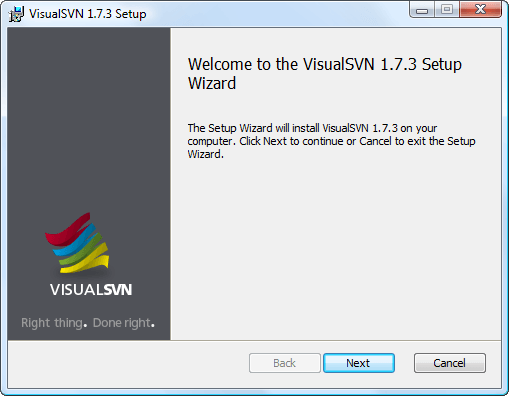 Now, let’s go through the steps to install the Visual SVN client on your development/client machine. 2.) Click ‘Next’ and you’ll see the following dialog. Accept the License Agreement and click ‘Next’ again. 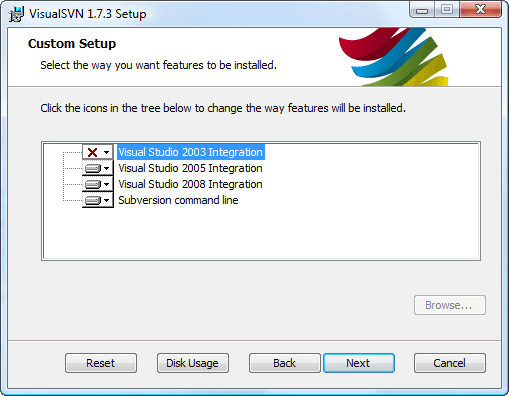 I chose to not install the “Visual Studio 2003 Integration” piece as I do not develop in VS2003 anymore. I don’t use VS2005 much either, but I figured I’d leave it just in case. 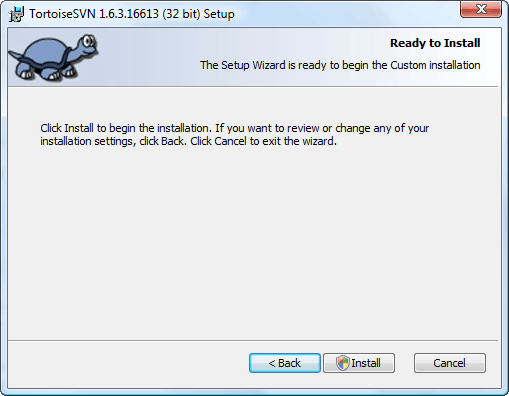 Click ‘Install’ to install the Visual SVN client. 5.) One last dialog. 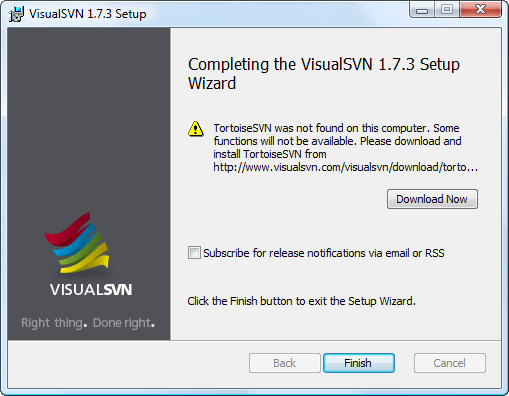 If you haven’t already, you can click ‘Download Now’ to download Tortoise SVN. 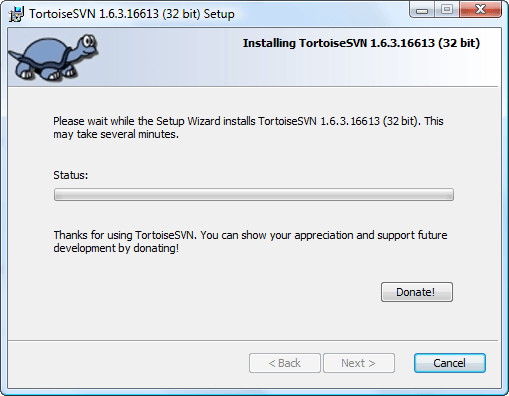 Tortoise provides a lot of the file-level plumbing for Visual SVN, and is a recommended (and free, though donations are accepted), complementary install. 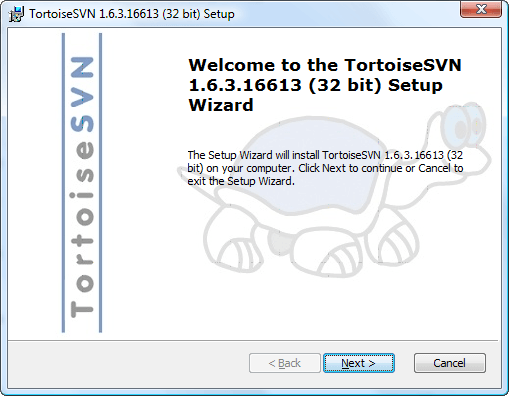 Next, we’ll go over installing Tortoise SVN. 2.) 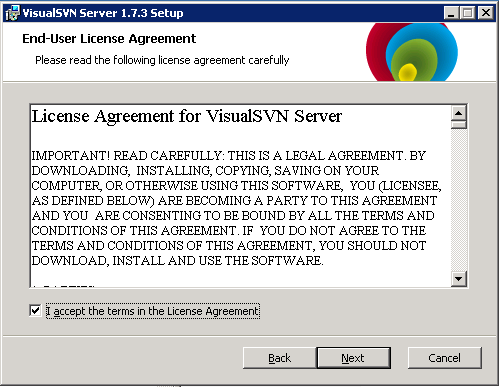 Click ‘Next’, accept the licensing terms on the next dialog, and click ‘Next’ again. 3.) On the following dialog I didn’t see a need to install the ‘GB’ version of English, but I went with everything else. 4.) 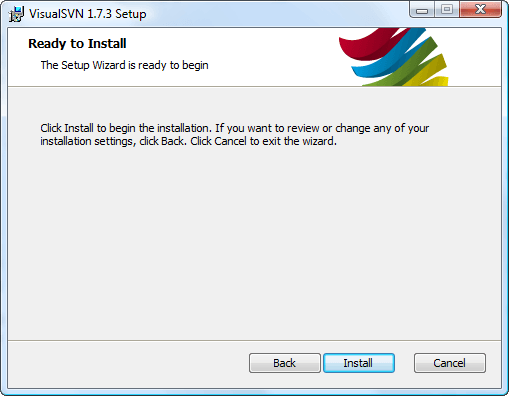 Click ‘Next’, then ‘Install’ to get the install rolling. 6.) That’s it. Pretty painless. Click ‘Finish’ to exit the final dialog. 7.) Oops. One more step. You may want to restart as it asks. I did. 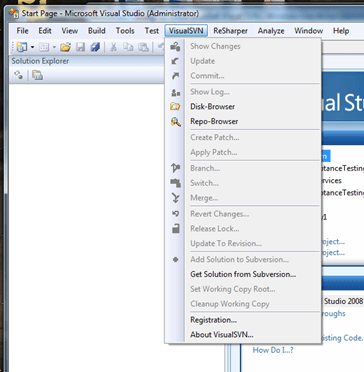 As far as #1, you can see below that Visual SVN gives you a new menu in Visual Studio from which you can browse your repositories and manage your source control functions. 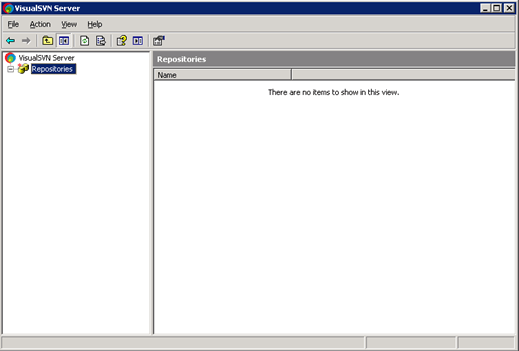 Of course, remember to open port 8443 (or whatever port you specified during install) on your firewall.